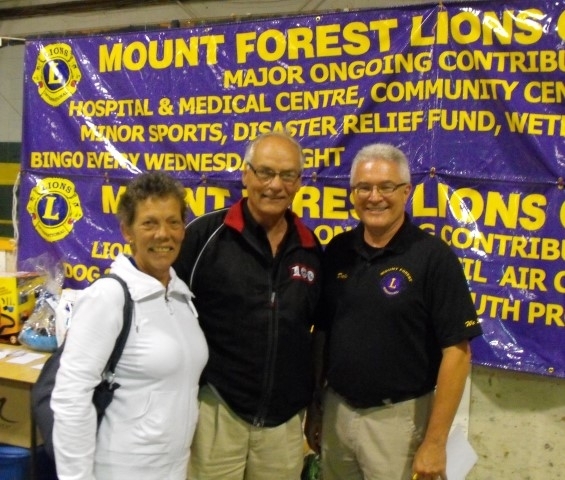 The Mount Forest Lions Club was formed in 1938 and currently has over 50 members. The Club meets on the 1st and 3rd Thursdays of each month (except July and August) at the Mount Forest Legion, Branch 134, 140 King St West, Mount Forest. Meetings start at 6:45 pm and include dinner. We are very proud of the Lions here in Mount Forest, and around the world. Our Lions motto is – "WE SERVE", and we do serve here in Mount Forest. But, we couldn’t accomplish that service without you, the public !! If you look around the community, you’ll find the Lions logo on a number of locations. You’ll find the logo at the Lion Roy Grant Pool (Roy Grant was one of the founding Lions here in Mount Forest some 75 years ago), a number of parks, including the Lion Bill Moody Park on Wellington Street East. This park was just officially opened on June 1st 2013. You’ll find the Lions logo on the Fire Department Rescue Vehicle and All Terrain Rescue Vehicle. You’ll find the Lions supporting our local hospital, and local sports teams. All of these activities are supported by you, the public. If you’d like to join us, give us a shout through our website, and we’ll get back to you. MPP Perth Wellington Randy Pettapiece, (also a Lion) along with his wife and Mount Forest Lion Dale Small.